A Washington photographer has re-created sweeping photos from a 1930s-era project to document the country’s national parks and forests. 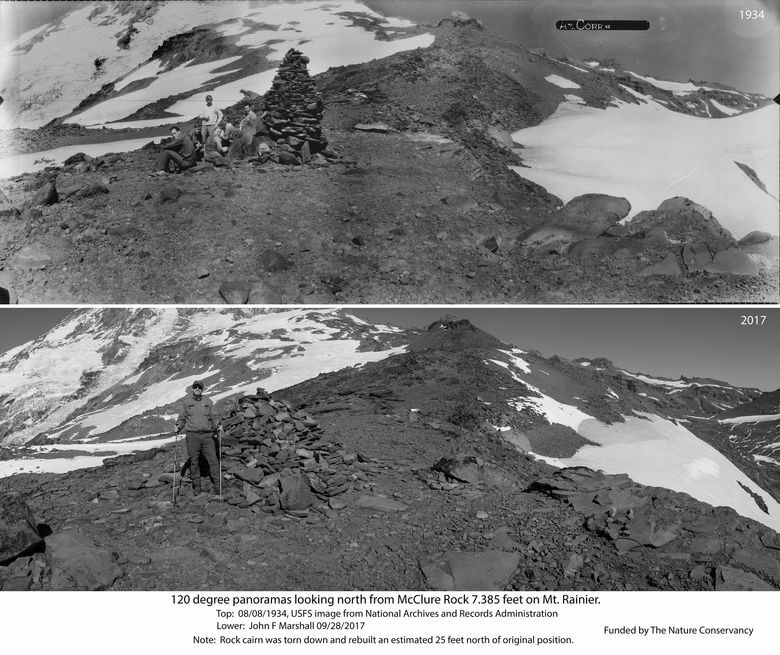 A series of panoramic photographs taken during the Great Depression is offering a new view of ecological change across the Pacific Northwest, including the dramatic retreat of glaciers on the region’s most iconic peak. 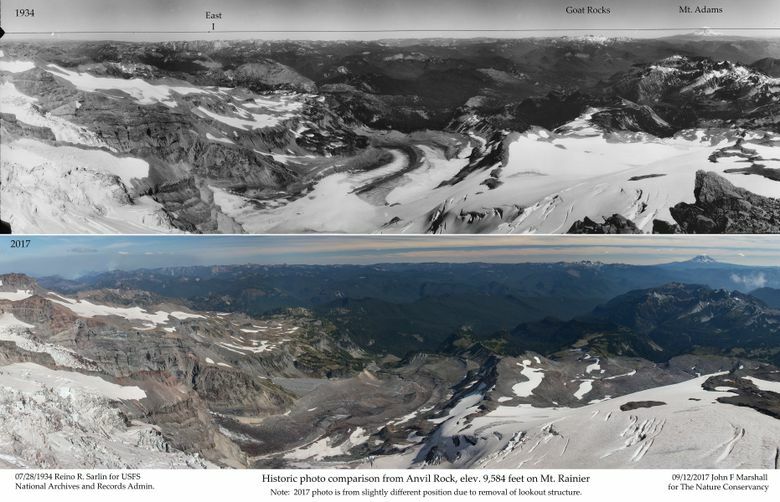 In 1934, when a young Forest Service photographer lugged his 75-pound camera to Anvil Rock high on the southern flank of Mount Rainier, the vista he captured showed the curling sweep of the Cowlitz Glacier snaking down the valley below. When Wenatchee-based photographer John F. Marshall re-created the same image with modern equipment 83 years later, the valley stretched out bare and empty of ice. Wednesday’s event, which is free and open to the public, runs from 7 to 8 p.m. The Center for Urban Horticulture is at 3501 N.E. 41st St., Seattle. 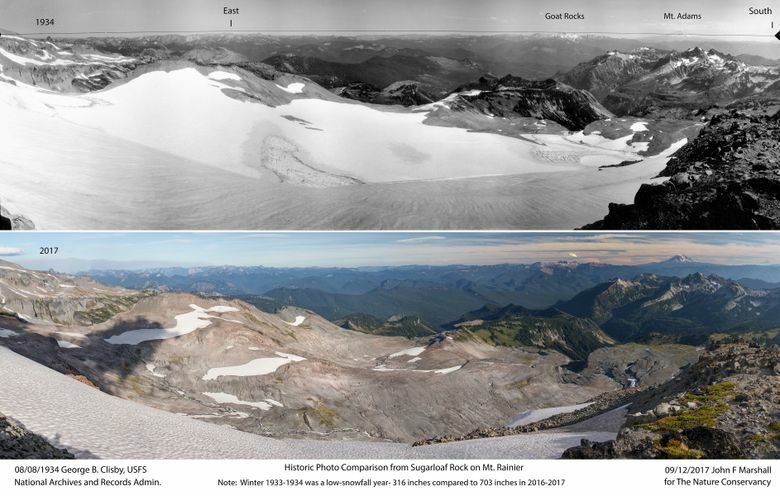 A selection of “before-and-after” glacier scenes will be featured Wednesday evening in a program called “Art Meets Science atop Mount Rainier’s Glaciers” at the University of Washington’s Center for Urban Horticulture. Focused on glacial loss and its consequences, the program is sponsored by The Nature Conservancy, which has helped support Marshall’s quest to make the historic photos more widely available and capture contemporary versions. Launched as part of President Franklin Roosevelt’s Civilian Conservation Corps, the 1930s-era photographic blitz was embraced and expanded by the U.S. Forest Service and National Park Service to document landscapes across the country. The panoramas were mainly used as references for firefighting and fire spotting. The images were shot with a contraption called an Osborne photo-recording transit, invented by Forest Service employee William Osborne to combine the functions of a camera and a surveying instrument. 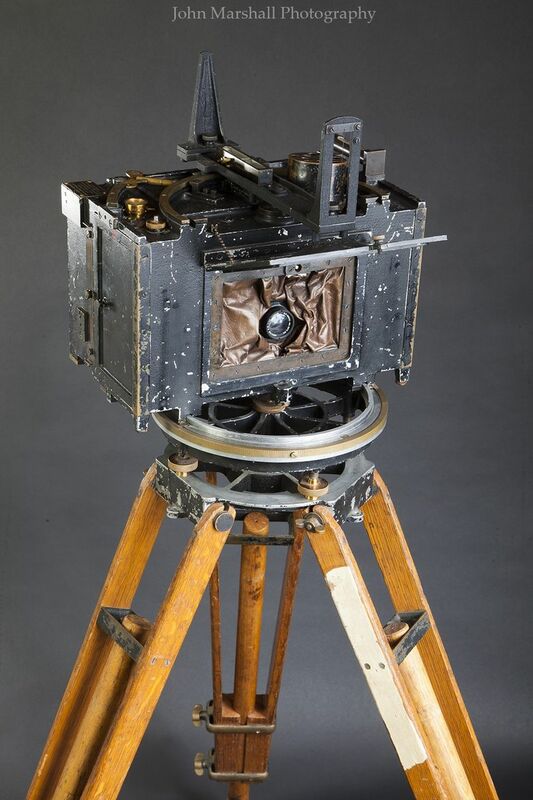 A windup motor rotated a curved film plate inside the camera to capture a vast sweep without the distortion of a wide-angle lens, Marshall explained. More than 3,000 Osborne images, most shot from fire lookouts, are stored in the National Archives in Seattle. For the modern glacier shots on Mount Rainier, Marshall returned to some of the same spots multiple times for optimal light and cloud cover. His old-school predecessors didn’t have that luxury, so some of the historic photos are hazy or overexposed. But even if the quality isn’t consistent, the images are proving invaluable to modern land managers, Marshall said. In Washington, the Forest Service commissioned him to reshoot dozens of scenes, looking for insights to historic forest composition and the effects of logging and decades of fire suppression. One of the biggest challenges is finding the sites of old fire lookouts, many of which have been demolished. Where regulations allow, Marshall uses a drone to hover at the height from which the original pictures were taken. For The Nature Conservancy in Oregon, Marshall scanned and uploaded more than 1,200 images, now available through an online archive. At Rainier, the high-angle shots offer a different perspective on the well-documented retreat of glaciers, said Paul Kennard, regional geomorphologist for the Park Service. The 1934 scene from a promontory called Sugarloaf Rock at 7,789 feet on the route to Camp Muir is dominated by the white expanse of the lower Paradise and Stevens glaciers. By 2017, both ice rivers had essentially vanished. At least four other glaciers also have disappeared, Kennard said, and all of the others are in retreat. The Nisqually Glacier is losing nearly a quarter of a mile in length a year, Kennard added. A similar trend is under way globally, which the Intergovernmental Panel on Climate Change says is likely caused by climate change. Impacts of shrinking glaciers at Mount Rainier include more sediment being dumped into rivers and streams, Kennard said, coupled with a higher risk of debris flows, which damage roads and trails.